This legendary lost chart was drawn by Henry Roberts, Masters Mate on the HMS Resolution, for the authorized atlas of Cook’s third voyage but because of disputes among the editors, it was not included in the final publication of Cook’s Journals. It is now known that the plate for the Robert’s chart, “a version more elaborate that that in the authorized atlas” (see footnote below), was purchased by London map publisher William Faden and published separately. This exceptionally rare first state of the Roberts – Faden chart, in addition to showing Cook’s discoveries, is the first published map to show the discoveries of Samuel Hearn in the Canadian Arctic. Hearn’s journal and maps were finally published in 1795. This “lost chart” contains a number of place names not found on the authorized version including, surprisingly, Snug Corner Cove, an important anchorage for Cook and subsequent voyagers and the subject of a grand, double page, engraved illustration in the Cook atlas. 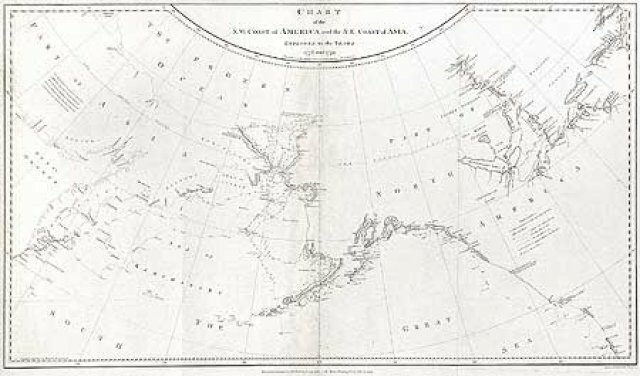 The Roberts chart also includes important information, which had never previously appeared in print, showing the Coppermine River (information probably suppressed for commercial reasons by the Hudson’s Bay Company) and the impossibility of a Northwest Passage through Hudson’s Bay to the Pacific Ocean. 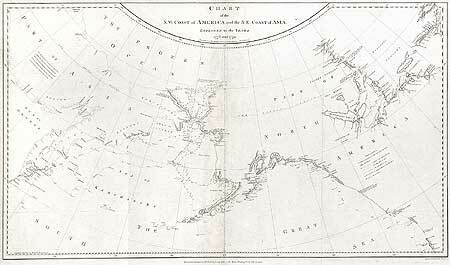 The “lost chart” by Henry Roberts of 1784 became the basis for William Faden’s 1794 Chart of the N.W. Coast of America and the N.E. Coast of Asia appearing as item #19 in the Exhibit and as plate 25 in the catalog of Mapping the Pacific Coast, and as the next map in the online tour.